This is dangerous territory–partly because some have trumbled into the “real” meaning of this or that book and caused an awful mess. When read this way the Bible most especially becomes secret code for everything from American foreign policy to the missing political allies of Atlantis to the reason why its words mean the exact opposite of what they say. That’s right, the picture to the right is about the hidden Roswell UFO links in the King James Bible. 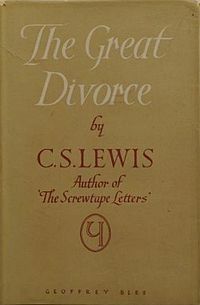 In The Great Divorce, Lewis describes heaven and hell with vivid clarity: the great, apathetic, narcissistic, blandness of hell contrasted to the bright, sharp, penetrating beauty of heaven. Lewis wants here to avoid a school of thought that would blame him for redrawing the faint lines of historic teaching about the after-life. He only wants to go as far as Dante, telling a morally invested story with the artistry that he has. But Dante really did redraw the lines of eschatology, whether we have read him or not. His cosmography of hell, purgatory, and heaven has stuck with us, shaping our cultural understanding, repainting every bit of our imagination from catechism classes all the way up to the works of the greatest modern artists. Perhaps Lewis is trying to have the reader keep the moral, and even the tang of heaven and hell, without accepting its landscape. So why do I push in to what he has created, trying to discern meaning that he seems to resist? Besides the Dante Effect–the reality that art and culture shape culture and thought–there are two reasons. There is something of The Great Divorce that tells the truth about C.S. Lewis’ understanding of the world. Without trying to bend Lewis, or find the super secret Bible code, that something that frightened Lewis is worth exploring. Lewis cautions against trying to live the heaven-in-all-good now, suggesting that if we do “we are likely to embrace the false and disastrous converse and fancy that everything is good and everywhere is Heaven” (Preface). Otherwise, though, he is saying something definite about heaven and hell. We are not to imagine heaven and hell as distinct, geographically specific domains. “[Hell] is in no sense parallel to heaven: it is ‘the darkness outside’, the outer rim where being fades away into nonentity” (“Hell”). This was written about 5 years before The Great Divorce. Not quite a decade later, Lewis encapsulated some of his understanding of heaven in the final Narnian chronicle, The Last Battle (1956). There is a great deal to say about that complex little book, but two sets of characters show us something of Lewis’ eschatological imagination. In one scene, a group of Dwarfs sit in a tight circle, refusing to admit that they are in heaven. In another scene, a Calormene officer, Emeth, is invited into this Narnian heaven even though he had served as an enemy of Aslan. Aslan says, “I take to me the services which thou hast done to Tash.” These two scenes show The Great Divorce idea of the continuity of earthly life into either heaven or hell, as well as the blurring of the regional boundaries. “… a damned soul is nearly nothing: it is shrunk, shut up in itself. Good beats upon the damned incessantly as sound waves beat on the ears of the deaf, but they cannot receive it. Their fists are clenched, their teeth are clenched, their eyes fast shut. First they will not, in the end they cannot, open their hands for gifts, or their mouths for food, or their eyes to see” (ch. 13). 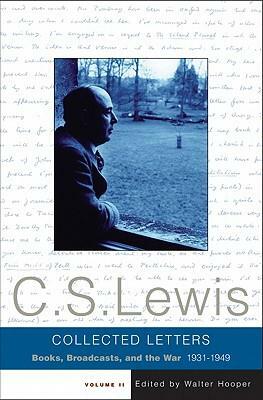 “Lewis removed this huge stumbling block to Christianity and vindicated both the justice and mercy of God” (see here). 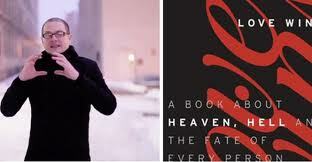 Another author, and one with a far greater influence, is Rob Bell. Though often missed by reviewers, Bell’s work is shot through with Lewis’ influence. In Love Wins, that book that transformed millions of readers and set the stage for his exit left from the evangelical conversation, Bell argues exactly for the continuity that Lewis sets up in The Great Divorce. Heaven and hell are both experienced here on earth, and one’s decisions sets one in a heavenward or hell-ward direction. We can bring heaven into our earthbound reality, or we can sow hell into everyday life. While Bell isn’t very clear about what this means for the actual movement of the human being into the realms beyond, it is a powerful image as a spiritual truth. Bell leans on Lewis for this road map. Still, as we think about heaven and hell, we remember Lewis’ caution. Is this arousing “factual curiosity about the details of the after-world?” I have to admit that as he poignantly captures the landscapes of heaven and hell in imagination, I’m tempted to believe that his landscape hints at something factual. 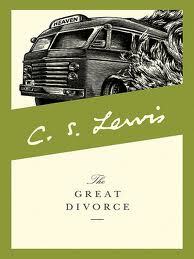 And it may be that Lewis offers something to Christian thinking about choice, salvation, and the after-life. But I don’t think that’s the deepest meaning of The Great Divorce–as much as I like a good controversy. 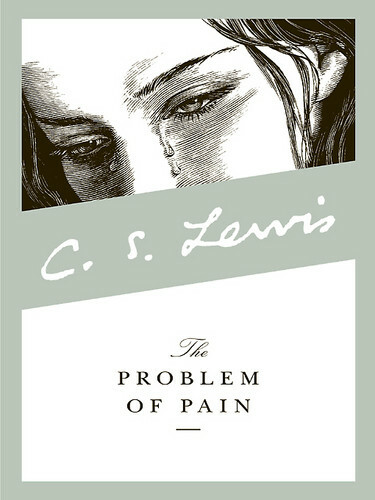 Through this speculative fantasy, Lewis captures the truth of the human condition–the truth of his human condition. Most of us are not murderers or rapists or dictators, yet we play with evil within the subtle inclinations of our hearts. We do this not to evil men or even to strangers. No, we rage against or manipulate the ones we claim to love. I rage against and manipulate the ones I love. In this I am sowing hell on earth, bending myself toward self–that is, bending myself toward hell. I have been crucified with Christ. I no longer live, but Christ lives in me. So the life that I now live, I live in faith in the son of God who loves me and gave up his life for me. “One dreadful glance over my shoulder I essayed-not long enough to see (or did I see?) the rim of the sunrise that shoots Time dead with golden arrows and puts to flight all phantasmal shapes. “But it was too late. The light, like solid blocks, intolerable of edge and weight, came thundering upon my head. Next moment the folds of my Teacher’s garment were only the folds of the old ink-stained cloth on my study table which I had pulled down with me as I fell from my chair. The blocks of light were only the books which I had pulled off with it, falling about my head. I awoke in a cold room, hunched on the floor beside a black and empty grate, the clock striking three, and the siren howling overhead” (ch. 14). 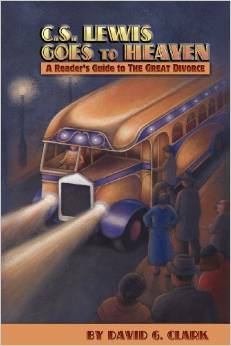 What is the secret code of The Great Divorce? It’s the basic principle that it matters how we live, and whatever lies we tell ourselves in the dark will be set to flight in the truth of that last great sunrise. This entry was posted in Reflections and tagged C.S. Lewis, controversy, Dante, Galatians 2:20, George MacDonald, heaven, hell, Love Wins, Narnia, Rob Bell, self-death, The Great Divorce, The Last Battle, The Problem of Pain, theology. Bookmark the permalink. “Song,” not “son,” although I am a pastor like his dad, and would be proud to have him for a son! Pretty hilarious, I got the second response first and had NO idea what you were talking about. It all makes sense here! I’m a big Andrew Peterson fan, and think I reviewed him on here somewhere. We all know wonderful sons! Apparently Andy Gullahorn is one of the back up musicians. Love him too. Thanks so much for the response, Karen. I’m glad it connected with you. And thanks for the MacDonald link: we are one another’s students! And I am blown away by your stained glass work. Wow! Are you interested in curating a little blog on either 1) children’s lit; 2) Inklings; or 3) fantasy broadly? It does not have to be writing heavy, but a few pieces highlighted with some text–either commentary, context, or quotes–with some links to your studio. now it is i who am blown away! Yes…yes!! Before coming to read this today, I read his poem, “Donkeys’ Delight”, first published a good couple years after The Great Divorce, on 5 November 1947: it struck me as a kind of hopeful analogue or variant of it, in miniature. I wonder if the thought of the interrelation of life now to Heaven in The Great Divorce is related in particular to what St. Angela of Foligno says, in Dante’s Paradiso – and perhaps even especially to Williams’s treatment of it in The Figure of Beatrice. And I wonder how Patristic/Early Church the imagery of where Lewis and the excursionists reach, is: a vision in the Passion of Sts. Perpetua and Felicity comes to mind, and also, more generally, the Shepherd of Hermas, and a phrase in the Liturgy of St. John Chrysostom, though I have checked none of these before writing this comment. Reading Lewis’s dream-vision MacDonald saying, “Their fists are clenched, […]. First they will not, in the end they cannot, open their hands for gifts”, I was reminded of a very striking passage of MacDonald’s Lilith (though I have not checked it, yet, either): is Lewis perhaps allusively suggesting the depth and breadth of hope, there, simply (rather than impliicitly to ‘correct’ the real MacDonald)? Enjoyed learning more history behind this classic and chewing on the deeper meaning. I appreciate Lewis’s disclaimer, whereas Rob Bell likes to expound as if he has a fresh interpretation on the truth. Lewis is the wiser. The spot on way that Lewis, in the GD, can expose the way human’s justify sin and how, in the light of Truth we see it for what it is, reminds me of a scene in “Til We Have Faces.” When Orual has brought her book of complaints to shove in the face of the gods . . . and looks down to find it is but a scrawny, scrawled piece of paper, “a vile scribble,” with no real substance. She reads it over and over again, though she’s not aware she’s doing so, until a judge interrupts her. After all her plans to write a tome that would express the injustice of the gods, she is silenced by her own sin, now fully exposed, as she reads the raw reality behind her complaints. I’m sure you’re better acquainted than I with this story, but I remember how I felt the weightiness of the truth when I read this scene. How we love to babble about our rights, how we’ve been wronged, and tout our own virtues. How we will see those things for what they really are when we are in the presence of the Omniscient God. I found that part of TWHF to be almost dreamlike, like stream consciousness writing. It is a brilliant move in a strong book. I have notes that link GD and TWHF, but I haven’t gone back to them for a year or so. Rob Bell might be right, but he is not clear enough for me to know for sure. I think he asks the right questions. His chapter on “Heaven has Flames” is pretty good. By the way, I started working on a fictional piece to submit for your GD focus, but have had other projects more pressing. The GD emphasis ends this month, correct? Well, strictly speaking it does. But I can run GD things any time. Keep working on it and let me know. Did you send me an email? I’m about 2 wks behind. Ok, great! I didn’t email. send a note to junkola [at] gmail [dot] com when ready. I don’t know Rob Bell’s work (yet), but it may be worth mentioning an interesting blog for related matters, Fr. Aidan Kimel’s Eclectic Orthodoxy. I am a follower of Eclectic Orthodoxy!